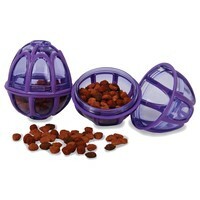 The Busy Buddy Kibble Nibble Feeder Ball appeals to a dog’s natural instincts by actively engaging him in mealtimes. Able to hold your dog’s entire meal, the Busy Buddy Kibble Nibble will randomly dispense dry food and treats, which your dog will have to catch and chase. Rubber bumpers on the toy will minimise noise and marks on the walls or floors. The toy unscrews for easy loading and quick clean-up. To use, twist apart the Kibble Nibble ball. Load with kibble, and then twist the toy back together. If you would like kibble to come out faster, you can trim the Treat Meter prongs. Once the prongs are cut, there’s no going back, so we recommend trimming only a little at a time and then testing. I love the shape of these, they don't roll miles away just round in a circle. The outer soft bars are softer so it is not as loud when it rolls along. Very pleased with this product. You can snip the plastic holes were the food comes out to fit the size of you kibble. Another good thing is that it is very easy to fill up and very easy to clean. Well worth the money.